Sketch based on specifications and bill of materials. South side view New York Central station in 1869. 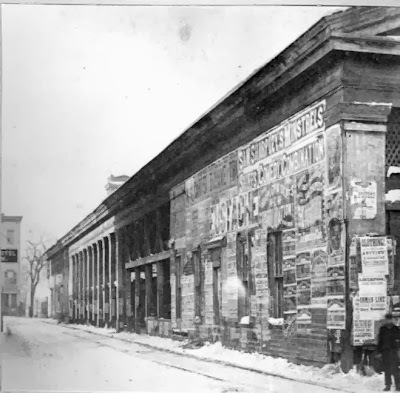 It has been occasionally asked, “where was the first railroad station in Syracuse?” Since this topic has been barely touched upon in the past, it seems appropriate to discuss the topic in some detail.The first railroad station located within the current city limits was where the Auburn & Syracuse Railroad temporarily ended at West Genesee street. It appears to have been built in late 1837 or early 1838 when horsepower was still used to draw trains. What slowed things down was the necessity of building a wooden trestle across a large pond that provided waterpower to the Red Mill. This pond covered much of the area just west of what is today South Franklin street which obstructed direct entry into downtown Syracuse. It covered most of what is now Armory Square and provided waterpower for the old Red Mill then located on West Genesee street. The trestle was built on pilings. On September 3, 1838, Levi Lewis, agent for the Auburn & Syracuse Railroad Company, applied to the village trustees for the privilege of erecting a depot for the use of the company on West Washington street between Salina and Clinton streets. The application was granted, stipulating it was to be no more than 18 feet wide and did not obstruct street traffic. This lasted from September, 1838 to June, 1839 when the first permanent station was built jointly by the Syracuse & Utica and Auburn & Syracuse railroads. By then the A&S had replaced horses with locomotives. It was then removed. Meanwhile, on July 19, 1838 the Syracuse & Utica applied for permission to build a “car house” on Washington street between Salina and Warren. The application was subject to a public meeting on December 26 at which railroad president John Wilkinson appeared. Village President .W. 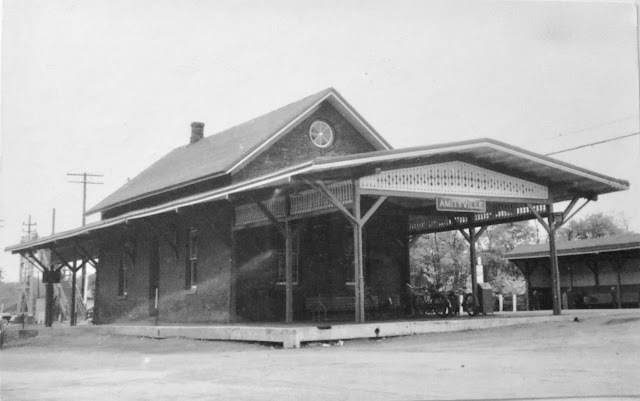 Leavenworth drafted the resolution granting the Syracuse & Utica Railroad Co. the privilege of building the station. The stipulations set forth in the resolution were that the building would be 49 feet wide. The company would purchase a strip of land four feet wide on the south line of block 101, and one of 26 feet in width on the north line of block 108. The company was instructed to leave an alley 14 feet wide on the north side of the building and a street 33 feet wide on the south side, and to flag the sidewalk on this street to keep the alley in good order.